A dramatic late race incident has caused chaos at Symmons Plains, with Will Davison capitalising on others’ misfortune and storming to victory today’s 200km race. Red Bull’s Shane van Gisbergen looked the clear winner on lap 80 of 84 until sliding off the track at the notoriously tough hairpin corner and lodging his car into the barriers. 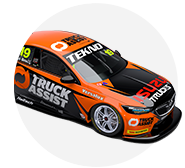 Teammate Jamie Whincup had speared off seconds before with Cameron Waters and Andre Heimgartner – and while the front-runner skated around the track on oil dropped by Waters’ Falcon, Davison capitalise to take his first win for TEKNO Autosports. Earlier today Davison had been quickest in qualifying but was stripped of pole position after an incident with James Courtney. “I’m speechless. I was pretty happy to bring home a top four today,” he said. Craig Lowndes was home in second after an early pit stop paid off with safety car timing, and Mark Winterbottom – who battled hard with van Gisbergen – was home third. It was a tough day for the Red Bulls, with quick cars both caught out in that incident at the end of the race. But the bad luck started earlier for Whincup, who had to stack behind van Gisbergen after an early safety car and later made a rare mistake at turn four, beaching his Red Bull Commodore and having to rejoin laps down at the rear of the field. A lap five incident saw Chris Pither’s Ford Falcon FG X smashed up on the exit of turn four after contact with Nick Percat and bringing out the safety car. Cars flooded into the pit lane and Craig Lowndes and Rick Kelly, who made early pit stops, benefitting while others scrambled in the pit lane. It was day over for Kelly shortly after though, struggling with brakes at the circuit where cars manage two big stops. Waters suffered an unusual issue, his car cutting out in pit lane, the team having to push him up the pit lane and into the garage. He later rejoined the race, and it seemed it was his oil on the track that caused the crash. 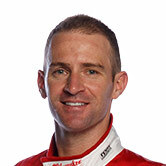 The result leaves Davison at the head of the Championship, with Lowndes and Whincup close behind. After a tough day yesterday, Scott McLaughlin bounced back to come fourth, with Chaz Mostert finishing in the top five. The V8 Supercars next race at Phillip Island from April 15 to 17.